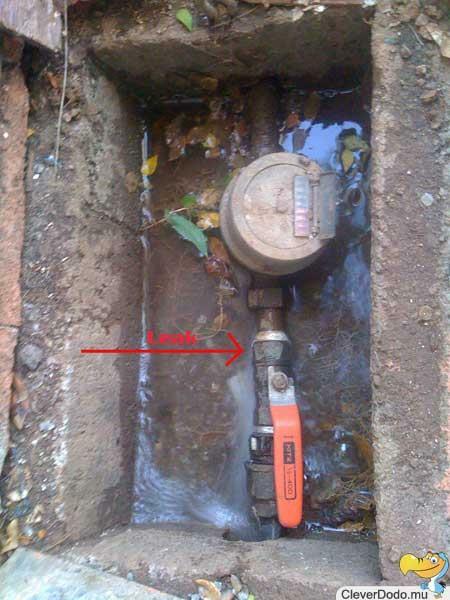 A couple of weeks ago, I noticed my water meter was leaking and after investigating the problem, I realised the guy who came to read the meter 2 days ago has caused some damage to it. It was six o’clock on a Wednesday evening when I decided to call the CWA hotline (170) to report the problem so they can fix it as soon as possible. The agent I spoke to asked whether the damage was before or after the meter and I wondered whether it really mattered but it turned out to be a very important question because any problem you experience which is after the meter becomes your responsibility and CWA will only be liable for damages before the meter. Fortunately for me, the leak was before the meter and the agent entered a complaint and told me they would contact me the next day if not that same evening. I thought they took their jobs seriously if they were to come the same day but that never happened. So on Thursday when they didn’t turn up in the morning, I made a second call and told them so much water was being wasted and they should treat this as urgent. I explained on my end I was turning the mains off except when we really needed water to wash dishes, cook and shower. It was an inconvenience to turn the water on and off like this but I was doing my best not to waste more water than what I couldn’t help and they should sort out the problem real quick. They assured me my complaint had been logged and they will get in touch with me sometime that day. In the evening, I called CWA for the third time and told them I was not happy nothing was being done about the water leakage I was having at home. They told me they’ve labelled my complaint as urgent on their end but it was up to the department concerned to act on it. Basically there was nothing I could do or they (the people on the hotline) could do. So I said enough was enough and decided to not to call them again. It is important to note that since the leak was before the meter, the latter was not running although water was being wasted but if your meter was registering the water wastage/usage, you would be billed accordingly and from what I found out, you would then have to go to a CWA branch to report the problem in person so they can take into consideration the leakage before issuing your next bill, otherwise you would get a nasty surprise at the end of the month. Anyway they didn’t turn up on Friday either and it was only on Saturday morning that I received the much awaited call from the CWA team. The plumber took a look at the leak and instantly knew a washer (garni – cahotsou ron ron nwar) needed replacement and proceeded to change it. I asked him whether they were really busy because I had to wait so many days for them to come and fix this problem and he said they have so much work that they need to work weekends as well. He mentioned they give priority to major water pipes on roads during the week days and do the smaller jobs during the weekend. All in all, it only took him 2 minutes to fix the leak. The reason I’ve put down 5 days is because the leak occurred 2 days before I noticed it and basically if I was not turning the mains off, the CWA would have lost 7200 litres of water which is equal to 7.2 cubic metres. In terms of price, it’s only Rs42 because for the first 10 cubic metres, you pay Rs6 per unit but 7200 litres of water going to waste is a shame especially in a country which has water problems. Even with the generous rainfall (or severe flood) we’ve experienced at the beginning of the year which has filled up our reservoir, they are still rationing the water supply in my area and water is cut off at specific times during the day and at weekends too. So you would think they would make an effort to stop any wastage but no, that’s not the case unfortunately. At night, we would let our water tank on the roof fill up before closing the mains so that we have water to brush our teeth the next day without having to go outside to switch the mains on. However we noticed the tank was empty every morning and it was only when the plumber came that we realised there was a backflow from the tank going through the meter and leaking everything out and if I knew that then, I would have shut down the tank to stop this from happening. There’s definitely a management problem with CWA. Like me, there are many households which experience leakages at some point or the other and that becomes a substantial amount of water which is being lost if not dealt straight away. If they cannot act on those requests urgently, they surely need to employ more staff to deal with those emergencies in a timely manner through contracted personnel if they don’t want to employ full time staff. That’s clean and treated water that we’re losing and there’s no excuse for it! What measures should be taken to ensure Mauritian citizens have adequate water during the drought season? How to unblock a waste drainage pipe? In summer times there are often a cut in water supply.What are actually the reasons for this? How should rapists be dealt with? Should I get the Samsung Galaxy S5 or wait for the iPhone 6?